Calculation Tools: a comparative overview is provided of the core characteristics of various logistics emissions calculation tools currently available on the market in order to provide prospective users with a starting point to understand which of these tools may best suit their needs. The overview is non-exhaustive and may be expanded over time with more tools. 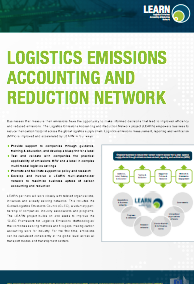 Training curriculum and materials for road freight carriers on emissions accounting available in English, Romanian and Spanish and which can be delivered as a webinar as well as in person. 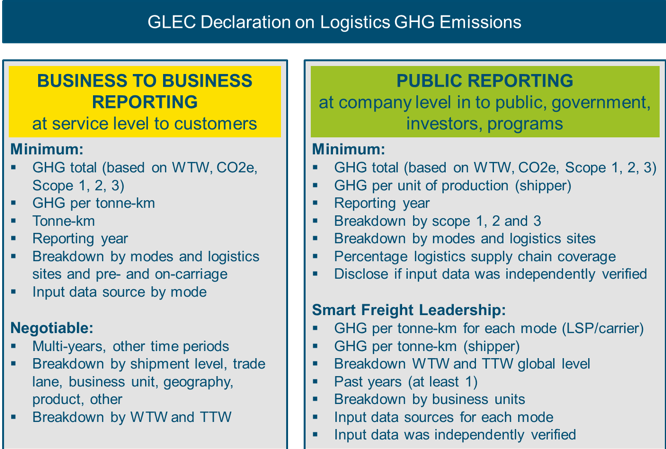 GLEC Declaration as a standardized format to request and report emissions figures. The GLEC Declaration works at two levels: business-to-business reporting and public reporting. 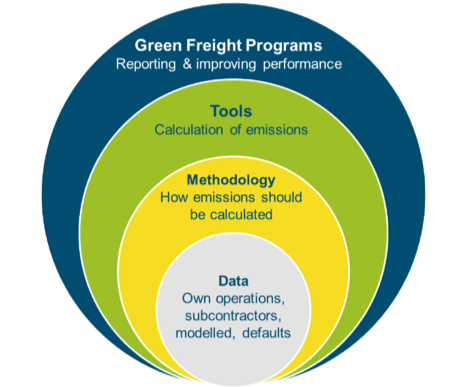 How do the GLEC Framework, calculation tools and green freight programs compare? The GLEC Framework is a methodology, and not a calculation tool or program. This is an important distinction because tools use a methodology to calculate emissions, so to incorporate the GLEC Framework into an existing tool would require an assessment of any changes that would need to be made. Programs that include emissions reporting either have their own tool, such as SmartWay, or prescribe a methodology for member companies to use, such as Green Freight Asia. Do you want to stay up-to-date with our activities, follow our newsletter. This project has received funding from the European Union’s Horizon 2020 research and innovation program under grant agreement No 723984.